Building an AI assistant to compete with the likes of Google Assistant and Siri is sure to be a challenge, and Samsung’s attempt, known as Bixby, hasn’t been entirely successful so far, but it’s set to improve with version 2.0, which will apparently be unveiled on October 18. According to The Korea Herald, Samsung will unveil Bixby 2.0 at its annual developer conference on that date, and the new version will apparently expand into third-party services and products, so it won’t be limited to Samsung devices and apparently it also won’t be limited to phones - perhaps it may arrive on some of the other best phones available right now. With Google Assistant and Amazon Alexa now available on a range of devices, including phones, wearables and smart speakers, that’s a move that makes sense if Samsung wants to compete. But Bixby itself should get better too, with Samsung’s mobile business chief Koh Dong-jin saying “we will supplement the incomplete parts of Bixby 1.0 at Bixby 2.0.” The company has even appointed a new service intelligence group head to drive those improvements. 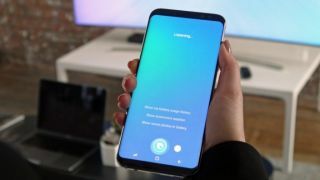 Exactly what those improvements will be remains to be seen, but we’ll presumably know soon, and Bixby is heading in the right direction, having added voice control with the launch of the Samsung Galaxy Note 8, and more recently allowing you to disable the Bixby button. One of our biggest remaining issues with Bixby is its inability to understand what’s being said some of the time. If Samsung could sort that as well as widening its support and availability, then the company could really be onto something.